Handles4doors is one of the country's leading suppliers of quality architectural ironmongery including: door handles, door locks, door hinges and door knobs to both trade and domestic customers. Our extensive online shop is home to thousands of door fixtures and fittings in a wealth of styles, finishes and designs from top brands - all with a focus on quality, style and performance. Our family run team pride themselves on product knowledge and quality service and we are always happy to help. You can also visit us at our showroom in Fleet for expert hands-on advice and sales. 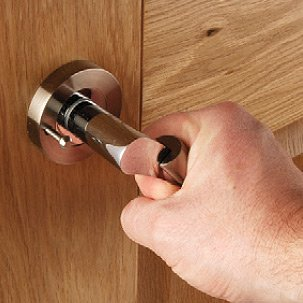 Make Handles4doors your one-stop-shop for all your architectural ironmongery needs! Find out more about Handles4doors. Since launching online in 2007, we've worked exceedingly hard to massively increase our range of product lines incorporating the very best door handles, door knobs, cupboard handles and thousands more door and window fittings and accessories. We want to ensure that all of our customers receive the very best quality products possible. All of our ranges of door furniture contain items designed and made by the world's leading manufacturers. Please see each individual product range for more details. You can be guaranteed years of hassle free use with all of these items. We don't just deal in door handles at Handles4doors. You'll also find a comprehensive range of door locks. Choose from a collection of insurance rated locks, mortice and euro cylinder locks, nightlatches and much, much more, all from amazing prices! So, if you want your doors locked tight for extra security, make sure you check the door locks we have in stock today. The diversity of our product range is what really makes us stand out. Not only do we have your interior and exterior handle and lock needs covered; we can also help you transform your cupboards and kitchen interiors with our sublime collection of kitchen cupboard handles and knobs. Find a massive range of styles and finishes, including polished brass, satin nickel and sleek chrome. Whether you want to go rustic, go contemporary or tackle a more traditional feel, we've got you covered. No project, either commercial or domestic, is too big or too small, so make Handles4doors your first choice for door and window fittings!